Discovering a variety of microscopic specimens in pond water is a common biology experiment for students both young and old. Below are some tips that will help you collect and identify microscopic pond life under your biological microscope. The easiest way to collect small pond life and organisms is to squeeze water from plants or pond scum into a container. Scraping growth from water plants or anything covered in green or brown growth will usually result in a high content of microscopic pond life. A plankton net is best for free swimming planktonic species. A plankton net is a very fine mesh cloth with a small container at the end. The plankton net can be used to concentrate the material squeezed out of water plants as well. Hydra captured under a biological microscope. Hydra can be collected by putting duckweed or other waterweed into a glass jar full of water. Wait for several hours and the hydra can be found attached to the glass. Keep your pond organisms in a shallow container. A large surface with only a copule of cm of water ensures there is enough oxygen in the water. If you wish to culture algae, cook some garden soil in water. After cooling, you can incubate it with the algae you want to grow. 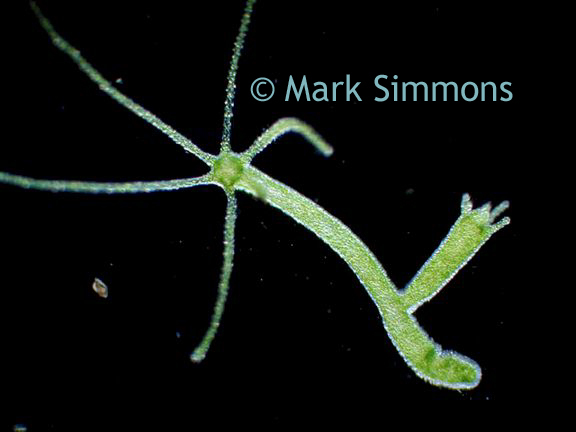 Desmids are beautiful small algae most abundant in waters without too many nutrients or acid waters. Bogs are good collecting spots for desmids. Amoeba are protozoa that often feed on material on the bottom sediment of a pond. The best method for collecting amoeba is to lower a jar upside down until it is positioned just above the mud surface. Slowly let the air escape so the top layer is sucked into the jar. 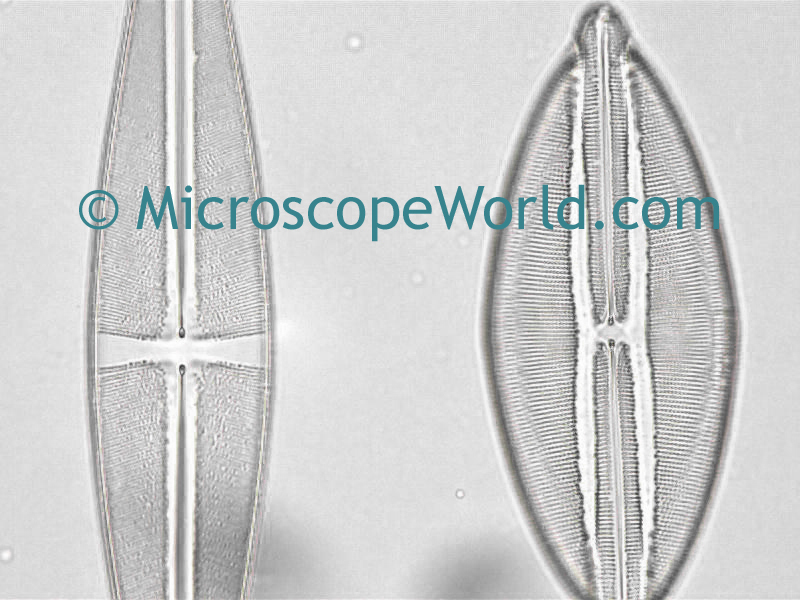 Diatoms captured with a student biology microscope. 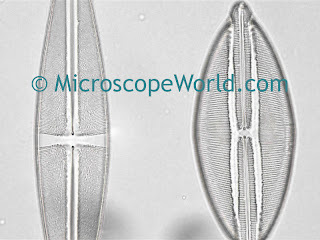 When viewing brown growth scraped off surfaces, there is a good chance you will find diatoms. The best way to view your microscopic pond life is by placing the sample on a depression slide with a glass cover slip. Put your specimen under the microscope and start with the lowest magnification. Once you bring the sample into focus, increase the magnfication. If you are having trouble identifying your specimen, send us an email with the image attached. We will be happy to try and help you determine which microscope pond life you have come across!